This brick was 3D-printed from simulated lunar soil using concentated sunlight from the solar furnace at the DLR German Aerospace Center facility in Cologne. Moon explorers could one day build their houses from bricks made out of lunar soil, or regolith, using just the energy of the sun, according to a new experiment by the European Space Agency (ESA). 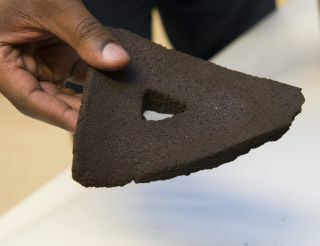 Using volcanic material with composition similar to that of lunar dust, a team led by materials engineer Advenit Makaya 3D-printed bricks and baked them in a solar furnace. The German Aerospace Center's (DLR) facility in Cologne, Germany, runs the furnace. The researchers said the strength of the bricks is equivalent to that of the mineral gypsum, which is a major component of plaster. However, the team has not yet performed all the necessary mechanical testing. The project is part of ESA's initiative aiming to develop technologies that could allow future lunar colonists to take advantage of local resources on the moon, according to the statement. By using locally sourced materials, the explorers would avoid the need to bring everything from Earth, and could travel more cheaply with a smaller spacecraft. However, the equipment used to make the 3D-printed brick is rather bulky. It consists of 147 curved mirrors focusing sunlight into a high-temperature beam that sinters the regolith into a solid mass. "For now, this project is a proof of concept, showing that such a lunar construction method is indeed feasible," Makaya said in the same statement. The solar furnace at the DLR German Aerospace Center facility in Cologne can work with just sunlight, but it also relies on the light of xenon lamps when the weather doesn't agree. As the weather in Cologne doesn't always provide the pure sunlight needed for the printing process, the team sometimes had to help the natural forces with an array of xenon lamps, similar to those found in cinema projectors, the study said. The researchers found that some of the lunar bricks tended to warp around the edges, which cool faster than the center. "We're looking at how to manage this effect, perhaps by occasionally accelerating the printing speed so that less heat accumulates within the brick," said Makaya. The team will continue developing the technology as part of the EU-funded RegoLight program. "Our demonstration took place in standard atmospheric conditions, but RegoLight will probe the printing of bricks in representative lunar conditions: vacuum and high-temperature extremes," Makaya said.